Revive your skin with this magnificent collection, which includes ingredients such as Resveratrol, Vitamin C, Palmitoyl Oligopeptide, Olea Europaea Oil, and Sodium Hyaluronate. 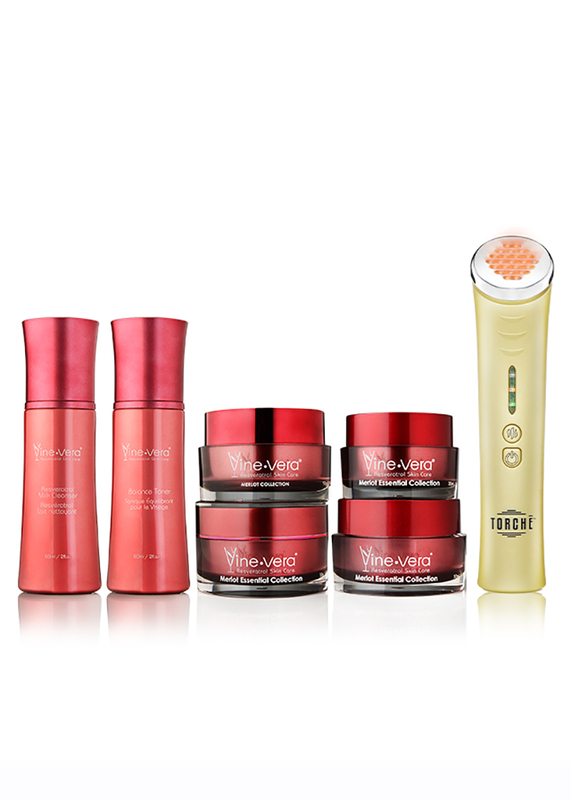 This collection will help reduce the signs of aging, while restoring your skin’s beautifying glow. Resveratrol Chianti Morning Recovery – 52 g. / 1.83 oz. This creamy yet lightweight formula is like a fresh breeze for your skin. The combination of ingredients such as Palmitoyl Tripeptide-1, Olea Europaea Oil (Olive Oil) and Resveratrol Ferment extract will help fight the signs of aging and intensify results from the Chianti collection. 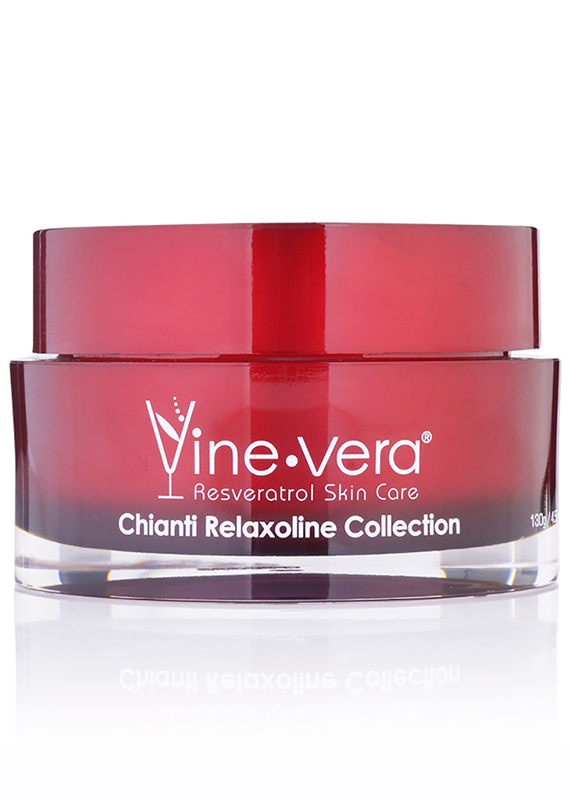 Resveratrol Chianti Thermic Mask – 130 g. / 4.58 oz. This unique formula has an instant warming effect when applied to skin. Bring the sauna to your own home with this magnificent thermic mask. Infused with sweet almond extract (Prunus Amygdalus Dulcis Seed Extract) and Aloe Barbadensis Leaf Extract, your skin will feel softer and more radiant. 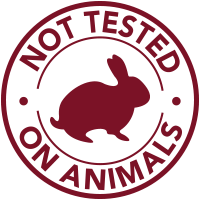 Resveratrol Chianti Revival Serum – 30 ml. / 1 fl. oz. This blend of Resveratrol Ferment extract, vitamin C (Ascorbic Acid), Palmitoyl Tripeptide-1 and the hydrating ingredient Sodium Hyaluronate, is a magnificent formula that helps reduce the appearance of wrinkles. This serum will leave your skin feeling softer, looking more radiant and refreshed. Resveratrol Chianti True Balance – 30 ml. / 1 fl. oz. Instantly smooth and diminish the appearance of fine lines and imperfections with Resveratrol Chianti True Balance from Vine Vera. Achieve an effortlessly flawless look with this transformational perfecting cream as Hyaluronic Acid and other botanical extracts deliver an immediate refining effect to your skin. 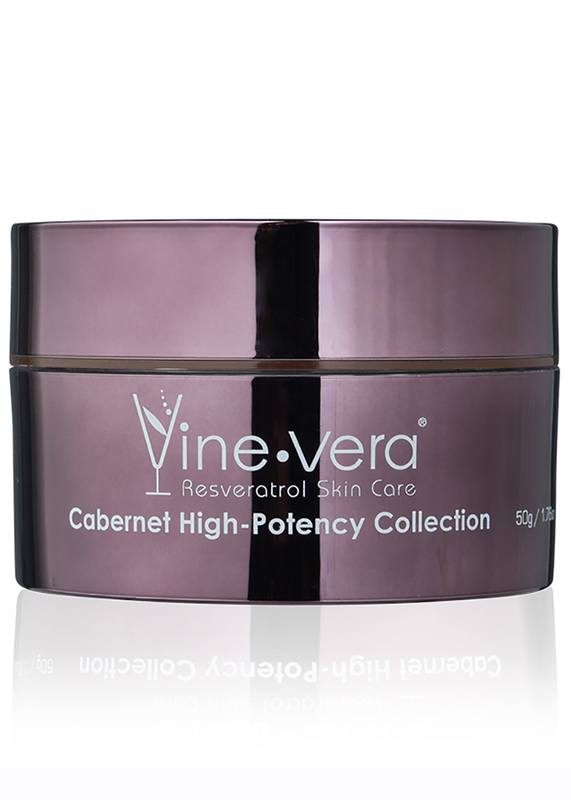 Resveratrol Cabernet Rejuvenating Facial Mask – 30 ml. / 1 fl. oz. Apply one time per week to clean face, leave on for 15 minutes then rinse off with cool water. 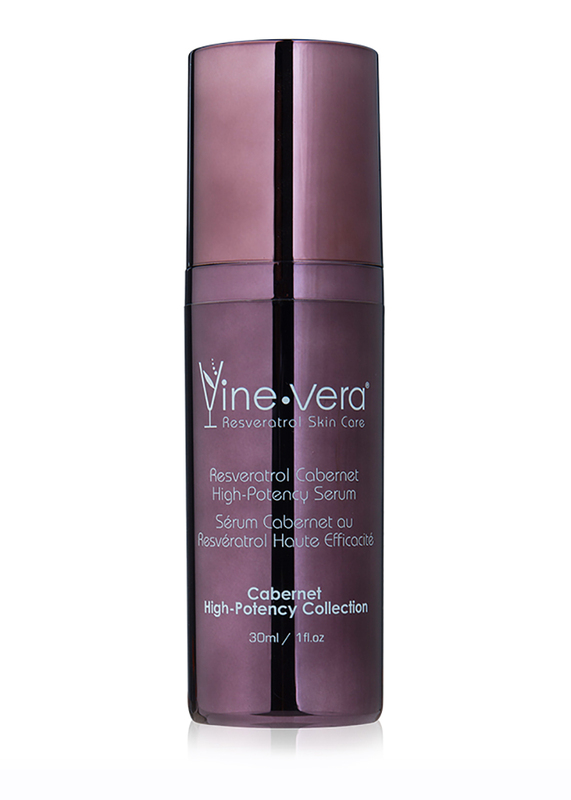 For best results, use in combination with VineVera Resveratrol Cabernet High-Potency Serum. 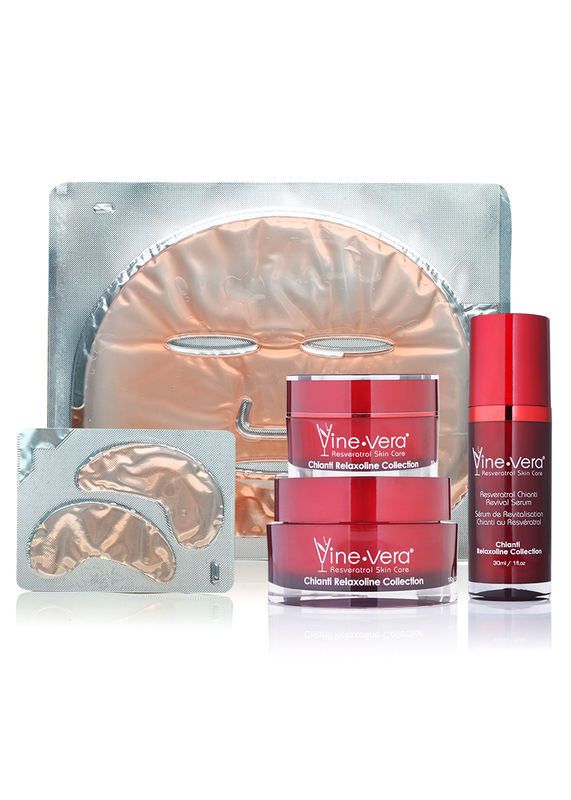 Resveratrol Cabernet Rejuvenating Eye Mask – 30 g. / 1 oz. Apply to orbital area avoiding internal contact with eyes. Leave eye mask on for 10 minutes and rinse off with cool water. 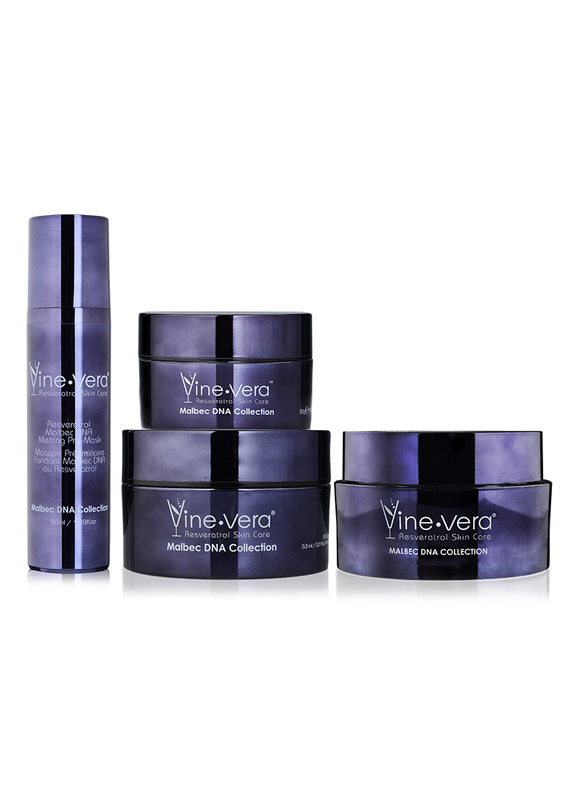 For best results, use in combination with VineVera Resveratrol Anti-Aging Eye Serum. Apply generously to face and neck area, paying particular attention to areas with deeper lines. 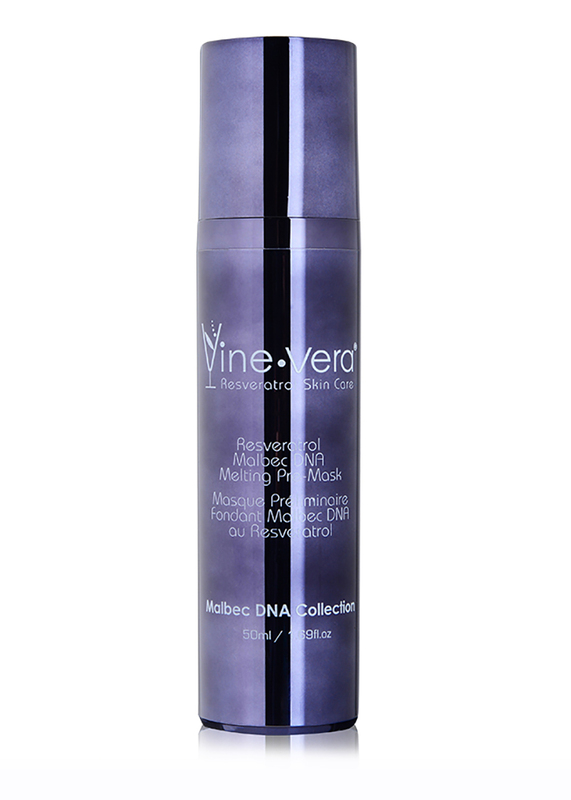 For best results, use in conjunction with Resveratrol Chianti Revival Serum. Apply to cleansed face, avoiding eye area. 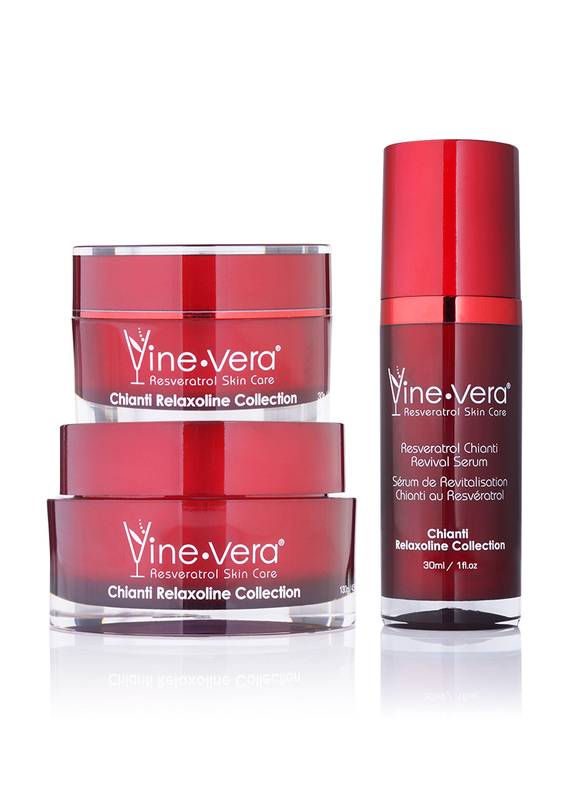 Apply Resveratrol Chianti Revival Serum to increase heating effect. Rinse with cool water after 15 minutes. Apply generously to face and neck area, paying particular attention to areas with deeper lines. For best results, use directly following Resveratrol Morning Recovery. Apply a small amount onto clean, dry skin, focusing on areas with fine lines and visible pores. Gently tap and massage until cream is absorbed. Aqua, C12-15 Alkyl Benzoate, Caprylic/Capric Triglyceride, Butylene Glycol, Glycerin, Cetyl Alcohol, Acetyl Hexapeptide-8, Palmitoyl Tetrapeptide-7, Palmitoyl Tripeptide-1, PEG-100 Stearate, Ceteareth-20, Cetearyl Alcohol, Glyceryl Stearate, Caffeine, Olea Europaea (Olive) Fruit Oil, Aloe Barbadensis Leaf Extract, Camellia Sinensis Leaf Extract, Glycyrrhiza Glabra Root Extract, Tocopheryl Acetate, Carbomer, Dimethicone, Ethylhexylglycerin, Phenoxyethanol, Pichia/Resveratrol Ferment Extract , Polysorbate 20, Retinyl Palmitate, Triethanolamine, Xanthan Gum, Disodium EDTA, Parfum. PEG-8, Kaolin, Zeolite, Methyl Gluceth-20, Ethylhexylglycerin, Phenoxyethanol, Pichia/Resveratrol Ferment Extract , Aloe Barbadensis Leaf Extract, Angelica Archangelica Root Extract, Arnica Montana Flower Extract, Ascorbic Acid, Citrus Limon (Lemon) Peel Extract, Coffea Arabica (Coffee) Seed Extract, Prunus Amygdalus Dulcis (Sweet Almond) Seed Extract, Retinyl Palmitate, Tocopheryl Acetate. Aqua, Glycerin, Acetyl Hexapeptide-8, Camellia Sinensis (Green Tea) Leaf Extract, Ceramide 2, Glycyrrhiza Glabra (Licorice) Root Extract, Hamamelis Virginiana (Witch Hazel) Leaf Extract, Laminaria Japonica (Seaweed) Extract , Palmitoyl Tetrapeptide-7, Palmitoyl Tripeptide-1, Sodium Hyaluronate, Sodium Polystyrene Sulfonate, Soluble Collagen, Ascorbic Acid , Butylene Glycol, Carbomer, Chitosan, Dimethylaminoethanol Tartrate , Kojic Acid, Polysorbate 20, Retinyl Palmitate , Sclerotium Gum, Tocopheryl Acetate, Hydrolyzed Elastin, Pichia/Resveratrol Ferment Extract , Ethylhexylglycerin, Phenoxyethanol, Tetrasodium EDTA, Triethanolamine, Parfum, Butylphenyl Methylpropional, Linalool, Limonene, Hydroxyisohexyl 3-cyclohexene Carboxaldehyde, Benzyl Benzoate, Benzyl Salicylate, Hydroxycitronellal. Aqua, Glycerol, Chitosan, Propylene Glycol, Sea Algae Extracts, Collagen, Hydroxyethyl Cellulose, Carrageenan Gum, Allantoin, Euxyl PO9010, Pitchia/Resveratrol Ferment Extract, Paraffin Oil, Hyaluronic Acid, Laureth-25, Lavender Oil.